Following the recent communal attack on Jumma villagers in Baghaihat and Khagrachari by Bengali settlers with the support of military forces, government of Bangladesh resumed initiative to conduct land survey in Rangamati, Khagrachari and Bandarban hill district of Chittagong Hill Tracts (CHT). As part of this initiative, Land Ministry called an inter-ministerial meeting at the ministry in Dhaka on 11 March 2010 where Land Minister Md. Rezaul Karim Hira presided over. Land Ministry also invited a representative of CHT Regional Council (CHTRC). However, no representative from CHTRC attended the meeting. Hence the land ministry has failed to decide when the government would begin the land survey in the CHT intended to resolve ongoing disputes over land ownership. Land Minister, however, said he hoped these matters would be finalised at the next meeting in mid-April which was being held in one of the three districts of CHT. CHTRC sent a letter to Land Ministry arguing that land survey would be contradictory to the CHT Accord if it is done before resolution of land disputes through land commission and rehabilitation of returnee refugees and IDPs as per CHT Acccord. In violation of this provision the officials of the government have been all the time interested to have cadastral survey of lands in CHT with a view to providing land titles mainly to the Bengali settlers on the lands they forcibly occupied or illegally allotted by the government. On 14 March 2010 Secretary of CHT Land Dispute Resolution Commission Md. 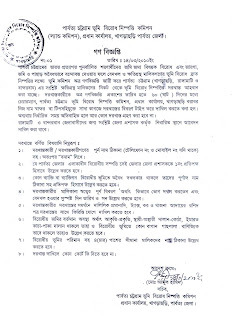 Abdul Hamid issued public notice asking affected land owners to lodge application on land disputes with Land Commission. The notice said that application must be filed within 60 days; otherwise no application would be accepted. 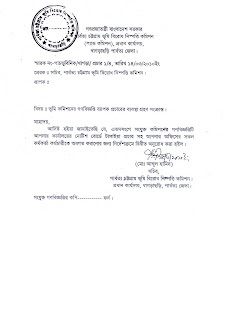 Please find the attached notice of Land Commission (in Bangla) for kind information. It is mentionable that this notice was issued without the decision of the Commission. Since after the appointment of present Chairman of CHT Land Dispute Resolution Commission, the only meeting was held on 27 January 2010 in Khagrachari. The meeting was ended without taking any concrete decision. § Clause 4, Part D of the CHT Accord contains a provision for settling the disputes of those lands and hills, which have been so far illegally settled and occupied, in addition to settling land disputes of the rehabilitated Jumma refugees. But the Section 6 (1)(a) of the CHT Land (Dispute Settlement) Commission Act 2001 only speaks of the “settlement of the land-disputes of the rehabilitated Jumma refugees”. Consequently, all other land-disputes of the Jumma refugees repatriated from India under the 20-point package will remain unsettled. § Section 7(5) of the Act provides, “The Chairman, on the basis of discussion with other members present, shall take decision on consensus on the subjects and other related matters stated under Section 6(1). But if no consensus is reached, the decision of the Chairman alone shall be considered as the decision of the Commission”. This provision of the Act can easily turn other members of the Land Commission into rubber stamps. It will make the Commission an undemocratic institution by empowering its Chairman with a dictatorial power. In order to amend the CHT Land Dispute Resolution Commission Act 200, two meeting were held at Land Ministry on 26 August 2009 and 06 December 2009 respectively. But no concrete decision was taken these meetings. However, without amendment of this Act, government is trying to start resolution of land disputes. The land problem of CHT will be more complicated if the government starts resolution of land disputes without amendment of contradictory provisions of the Act. It means that the Government of Bangladesh is not yet prepared to amend the Land Commission Act and to resolve the land disputes at all.